The modular KS light crane system offers versatile material handling solutions with ergonomic and efficient workflow. 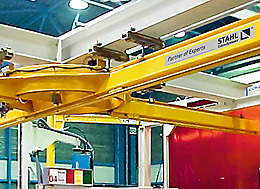 The profiles and trolleys are optimally adapted to our chain hoist programme. KS light crane technology offers three profile variants with a maximum S.W.L. of up to 2,000 kg. UKA profiles and guide elements are precision-machined. This simplifies erection and ensures that the profiles are accurately aligned. 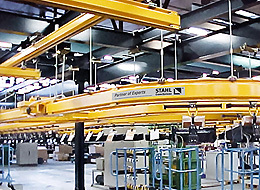 Single or double girder overhead travelling cranes, monorail runways and circular runways, and challenging solutions with combinations of straight sections, bends, switch points and turntables can be constructed quickly. To ensure that the load is transported smoothly and quietly, we employ trolleys with narrow nylon wheels which are mounted on ball-bearings and retained. Depending on profile size, the trolleys are self-centring or equipped with guide rollers which ensure the horizontal guidance is accurate even in bends. Thanks to the modular construction, manual trolleys can be retroactively combined with electric trolleys. Even the combination of different profile sizes is possible.